Ubiquiti quietly entered the whole home mesh Wi-Fi category last year with its AmpliFi lineup of routers. As a relative unknown, the company took an approach that differed from established competitors, particularly when it came to presentation and network flexibility. Now, it's continuing on that path to make the home network usable across borders. The AmpliFi Teleport is essentially a combination of the existing main router with a small extender. 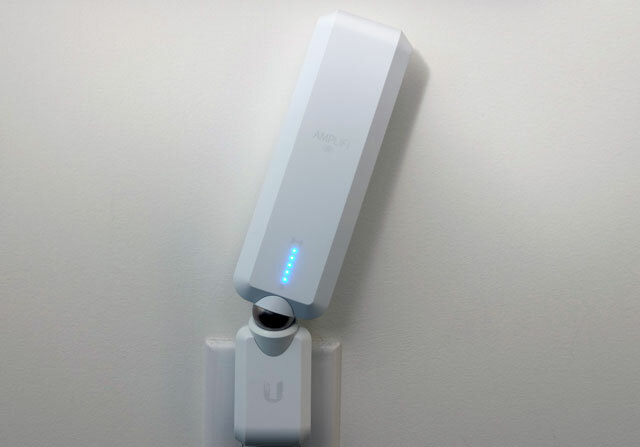 Previous AmpliFi systems came bundled with mesh points — antennas attached to a magnetic base that plugged directly into a wall outlet. Though it plugs into the wall, the Teleport is not a standard mesh point, which is where things diverge for the system we tested. The Teleport enables access to the home network and all the devices connected to it, even though you'd be connected to a different network while away from home. An additional benefit of such a unique setup is that you can access geo-restricted content when visiting another country. It sounds complicated but is actually quite simple. Ubiquiti got crowdfunding for the Teleport to bring it into production, and now that the assembly lines are operating, the system is available. Existing AmpliFi owners won't be left out of the loop since the Teleport unit itself is backward-compatible with earlier routers. Ubiquity is now taking pre-orders on its own website and will begin shipping in January. Retail availability will likely follow thereafter. The $229.99 AmpliFi Teleport package includes the AmpliFi HD router and one Teleport unit. The Teleport sells for $99.99 as a standalone that can work with existing AmpliFi HD routers. The AmpliFi HD is available for $129.99 on Amazon. It's not compatible with third-party routers, like Ubiquiti's mesh points can be. Mesh points are available for $108.99 apiece. I already had an AmpliFi HD router with two mesh points, but I set this up in a separate location and took one of the mesh points to gauge performance. Setting up the AmpliFi HD first was easy, and step-by-step instructions are covered in the free app for iOS or Android. From plugging everything in to making the necessary connections, the app and instructions are totally straightforward. Most of the legwork is done automatically. You can smooth the transition by using the same SSID and password as you did with your previous router — this way, you won't need to log into any of the connected devices in your home again. The AmpliFi HD itself is a cube-shaped device with a circular LCD touchscreen in front. The lower rim is lined with an LED ring that stays lit throughout the day. By default, it (and the screen) turn off from 10 p.m. until 8 a.m. to conserve energy, but you can always change that in the app. 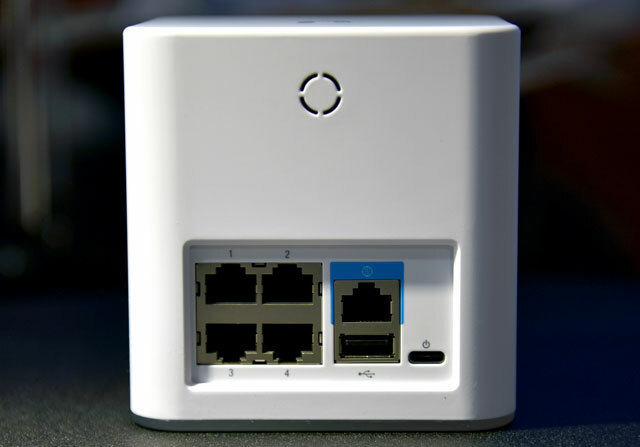 There is a WAN port (in blue) that connects directly to the modem, plus four Ethernet LAN ports for wired connections to hubs, servers or other devices. Power is drawn through the USB-C port with the other end plugging into a power outlet. There is a USB port, except it's inactive. Ubiquiti has said it has plans for it, yet hasn't yet specified what those entail. Either way, the router was up and running in less than 15 minutes. I downloaded and installed the latest firmware to ensure the device was running on the latest release. Adding mesh points is easy — just plug them into a wall outlet. Once the blue LEDs are lit, I went through the app to link it to the router, which it did itself. I could then assign a name or location (bedroom, living room, etc.) to the point, and that was it. Other than maybe pointing a mesh point toward the router to strengthen the connection between them, they need little upkeep beyond firmware updates. I could see signal strength both through the blue LEDs and by tapping the mesh point in the app. There's a progress bar to indicate connectivity efficacy. If you're in the "great" level or better, then all should be well. Ubiquiti uses one SSID, by default, to group together both the 2.4GHz and 5GHz bands, but it runs them concurrently. There was a way to separate them by tapping the router image in the app and then going to Wireless > Separate WiFi SSID, except there was no way to manually rename either network. Ubiquiti says a fix for that is coming. In the meantime, I set up a guest network under the 2.4GHz band so certain devices could connect. The Teleport requires a very different setup, and it might feel a little confusing at first. 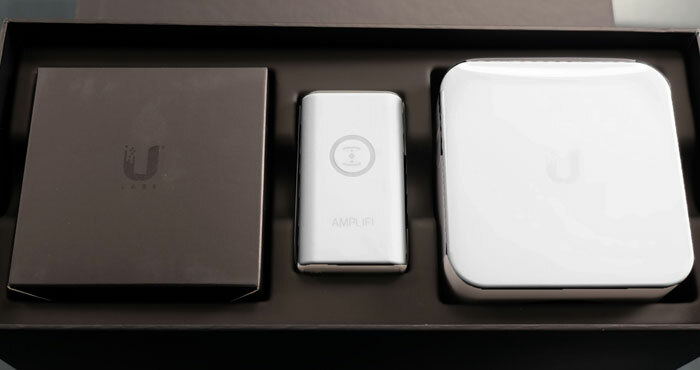 The AmpliFi HD will know the Teleport is plugged into a power outlet and recognize it, but the remote access features will need to be configured. First, tapping the Teleport from the main menu on the app will show that it's offline. 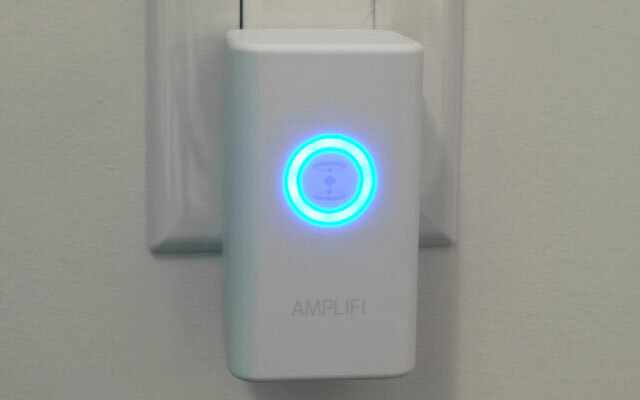 Although it's identified by the AmpliFi HD, it uses its own SSID to connect to devices because its primary purpose is usage away from home. The menu at the top left brings up a side menu for remote access, but there's a catch. Enabling the feature requires signing into either your Facebook or Google account. There is no social media integration here, so why bring either of those platforms in? Ubiquiti claims it's more convenient to expedite authentication. In lieu of a tedious process of registration, password setup, email verification and login, this simplifies things considerably. Plus, it's cheaper for Ubiquiti to piggyback off these two platforms than to deploy its own system. On the technical side, it can confirm that the person has authenticated using a known identifier. It's certainly not bulletproof, but it streamlines things. The company says it doesn't collect any information from those accounts, nor does it share anything about usage with either Facebook or Google. The easiest way to set this up, at least for me, was to create a Wi-Fi hotspot using my smartphone and have the Teleport log on to that. From there, I could create an SSID matching the one I use at home. I did it this way so my devices would automatically log on to my home network whenever I was using the Teleport away from home. For example, if I plugged the Teleport into a wall outlet in a hotel room and logged it onto the hotel's Wi-Fi, it would configure the connection so that I was effectively accessing my home network. It amounts to a tunnel that connects, say, my laptop, smartphone, tablet, etc., to my home network. There are several benefits to this setup. If I have a home server with lots of files, movies, music and photos, I can access them as smoothly when I'm away from home as if I were sitting right next to the server. And if I'm traveling abroad, I can also access services I subscribe to as if I were still connected locally. That means Netflix, HBO Go, Hulu and many more would still work, and in the case of Netflix, the available library would be my U.S. one, not whatever is offered to locals in the country I'm visiting. Since Netflix and other providers cracked down on virtual private networks (VPN) to circumvent geo-restrictions, this type of networking trickery is an effective alternative. Except, the whole venture depends on how good the connection is on either end — upload speed from home, and download speed at the remote location. Hotels often throttle the free Wi-Fi they offer, unless you pay for faster speed. That may be necessary to gain better performance. This setup allows both novice and experienced network administrators to feel empowered. The system uses band steering by default to determine which band devices should connect to. As I noted earlier, you could separate the bands to create distinct SSIDs, but you can't rename them. The router lets you adjust various settings: You can manually change the channel for either band to reduce interference, as well as manage port forwarding, DHCP server setup and more. You can even set it up in Bridge mode to connect two routers. It's not quite as deep as the most technical routers, but there's plenty to work with. Parental controls let you pause the internet on all devices, or on a specific one, at any time. Set up a profile for each family member and add their devices, so that access can also be restricted for a particular user without affecting the others. You can also block off specific times and/or days to cut off access. The AmpliFi HD router doesn't support MU-MIMO (multi-user, multi-input, multi-output), a protocol that funnels bandwidth to compatible devices simultaneously, rather than in a queue. While many devices still don't support it, its omission is disappointing. The router was already a stellar performer with its mesh points, so I wasn't surprised that it held up really well. Data transfer speeds were excellent, especially in closer quarters, routinely hitting above 140Mbps of my 150Mbps connection from my internet provider — within 30 feet of the router or a mesh point. It dissipated the further away I got, but never to a point where I felt the connection was in trouble. The app and touchscreen both indicate transfer speeds at any given time. Still, the Linksys Velop and Netgear Orbi can do the same with fewer resources. A two-pack Orbi I tested matched what an AmpliFi HD with two mesh points could do. Plus, the extra Orbi unit had the advantage of four LAN ports, whereas the mesh points have none. The AmpliFi HD holds up well against other competitors, like the Eero 2, TP-Link Deco M5 and Google Wifi, and I find its app is better than all of those, at this point. I would caution, however, that larger homes will probably need a third mesh point to space out the coverage, especially if you have multiple floors or a really wide space on one level. Which brings us to the Teleport. What it does, the other mesh routers can't do. I went to a friend's home and plugged it in to test its remote features, and was pleasantly surprised at how seamless it all felt. I was logging onto my home server and accessing media files like I was lounging in my living room. It was almost surreal. I didn't need to configure remote access for each connected device. It just worked. The Teleport's Ethernet port was also put to good use, letting me connect it to directly to a Roku Ultra. From there, I accessed the DS Video app and played a movie in HD I had stored on a Synology network attached storage (NAS) drive. I didn't travel abroad during testing, so can't confirm how the Teleport will work in maintaining a local connection to subscription services, but I don't see how it wouldn't work. Since the devices I'm using to connect to my home network kept IP addresses local to my home without a VPN spoofing the location, streaming services should work without a hitch. At least for now. Who knows if the services will look for ways to shut this door, too, in the future? 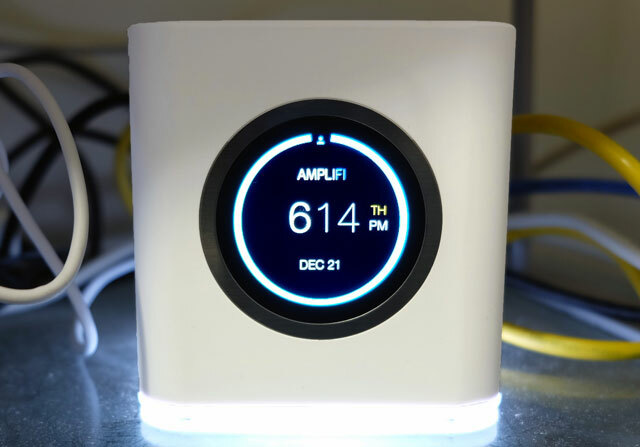 The AmpliFi HD ($129.99 standalone router, $249.99 router with two Mesh Points on Amazon) was already an interesting mesh Wi-Fi system, but it was competing in an increasingly crowded arena. More expensive, big-name brands like Linksys and Netgear could deliver faster speed and throughput. Ubiquiti's aesthetic is nice, but looking good isn't enough on its own. As effective as the router is, it needed another hook. The Teleport's a good one. It's a unique form of networking that should have wider appeal because it breaks down annoying walls. The problem is that routers and networking, in general, are often misunderstood by nontechnical people, so the impact will initially be felt mostly by those in the know. The cost of entry isn't low: You're looking at over $400 for the router, Teleport and two mesh points (on Amplifi.com) or $350, if you buy the system on Amazon and add the Teleporter. Ultimately, its value will depend on the price you put on the remote access features it enables. For existing AmpliFi HD owners, this is a no-brainer with plenty of potential. Can the teleporter act as a hotspot?